In response to both to obligations under CCPA & GDPR and growing consumer expectations for privacy protection, organizations across the globe have invested in tools to present consent terns and store consent logs. But the question is what next, once consent have been logged? Enter consent governance, which will allow organizations to align when, how and what consent was provided with data subject rights reporting and actual data processing flows. Consent governance progresses from the process of capturing consent and recording logs to all organizations to embed consent - and other lawful bases for processing - into analysis and evaluation of how an individual's personal data is processed. The California Consumer Privacy Act ("CaCPA") - the first data protection regulation of its kind in the U.S. - will go into effect on Jan 1, 2020. Join our Senior Director of Privacy Debra Farber for a discussion on what the CaCPA means for companies doing business in California, and how to prepare for its requirements. The discussion will provide a practical perspective on how companies can develop and tailor their privacy management programs to respect the new rights afforded to California consumers and what steps they should take between now and 2020 to comply. - The main similarities and differences between the CaCPA and the EU General Data Protection Regulation ("GDPR"). - Why the CaCPA means "no more business as usual" for how personal data are collected, governed, and secured. - The foundational processes, technology, and organizational elements that companies should put in place to prepare. - Trends: How other companies are approaching compliance with CaCPA. The impending California Consumer Privacy Act of 2018 doesn’t go as far as the EU General Data Protection Regulation in mandating consumer consent for collecting personal information. But the law will give California consumers the right to know what data is being collected about them, the right to request the deletion of their personal information, and details specific requirements for companies to comply with such requests. Plus, the first-of-its-kind law in the U.S. will introduce an entirely new definition of what constitutes personal data. - The consumer data rights obligations set out by CaCPA for covered entities. - The building blocks needed to implement and operationalize these consumer data rights. - How to inventory personal data, document data flows, and automate “right to know” processes. - Current initiatives for CaCPA revision. Orchestration and automation of data governance and cyber response processes are no longer imperatives driven only by operational efficiency imperatives. With the proliferation of privacy mandates and more stringent breach management and notification requirements, companies across the globe face both greater organizational risk as well as increasingly onerous penalties for non-compliance. And, as new regulations and requirements emerge, companies must ensure that their processes and workflows are flexible and can adapt to changing privacy regimes. In this joint webinar with HCL and BigID, we will discuss the repercussions of the shifting privacy landscape and demonstrate seamless integration of data intelligence insights and extensible workflows as a foundation for a flexible operationalization model. The California Consumer Privacy Act ("CaCPA") - the first data protection regulation of its kind in the U.S. - will go into effect on July 1, 2020. Join Doron Rotman, Managing Director and National Privacy Service [DMR] Co-Leader, Advisory at KPMG LLP and Debra Farber, Senior Director of Privacy at BigID, for a discussion on what the CaCPA means for companies doing business in California, and how to prepare for its requirements. The discussion will provide a practical perspective on how companies can develop and tailor their privacy management programs to respect the new rights afforded to California consumers and what steps they should take between now and 2020 to comply. An Integrated Approach Towards automating the creation and maintenance of Article 30 processing records using actual data records. - There is a better way than Visio for building data processing records. - How data knowledge and transparency can be achieved through automation. - How to move toward a continuous compliance model through workflow orchestration and data fulfillment. - How to leverage data knowledge for collaboration and to standardize processes. Privacy is About People. If you don't know whose data you have, you can't protect their privacy. GDPR data subject access rights requires companies to put that principle into practice. Yet, existing tools can't tell you what personal information belongs to which data subject in order to respond to data subject requests. A person-centric approach to locating and understanding data enables companies to effectively tackle the most challenging GDPR requirement: fulfilling Data Subject Access Requests at scale, across data sources and in minutes, not days. - How a person-centric approach addresses GDPR requirements centered on data subject rights. - How a person-centric approach can bridge automation of request management with fulfillment at scale by IT teams. Data subject rights are a cornerstone of the GDPR, yet traditional discovery tools can’t identify Personal Information (PI) versus PII and can’t automatically index personal information by the data subject. Operationalizing and fulfilling subject access request reports, data portability, rectification, and erasure requires a novel approach to finding, inventorying and reporting on personal information. - What are the GDPR data subject obligations? - Examination of different approaches to solving right to access, portability and erasure. - Considerations for operationalizing inside an enterprise. - A look at new tools like BigID for automating subject access. 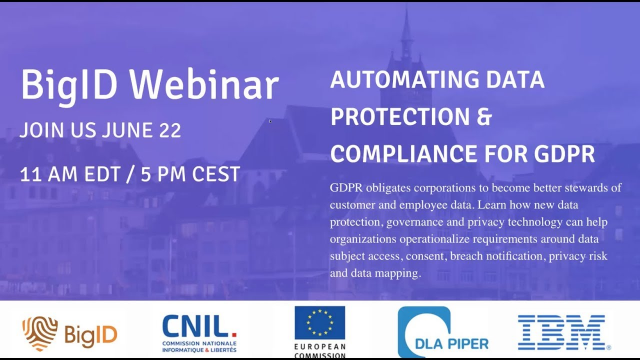 Join BigID, the IAPP and guests present and demo how to implement GDPR requirements like data subject rights using scanning vs surveys and more.